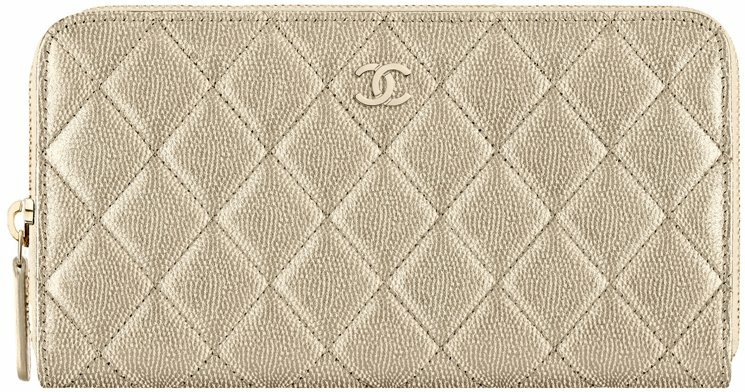 Be stylishly spot-on with this Chanel Zip Wallet in Washed Grained Calfskin. Banish fear of being caught pulling out an outdated wallet from your bag as this Zip Wallet from Chanel will make your fashionable life easier. A gorgeous and chic Zip Wallet in washed grained calfskin & ruthenium metal in blue color, this one is an extra fashion plus points! With its thick classic diamond quilting effect and the beautiful CC logo placed in the upper most center, you can take on the fashion world without the terror of being ostracized. 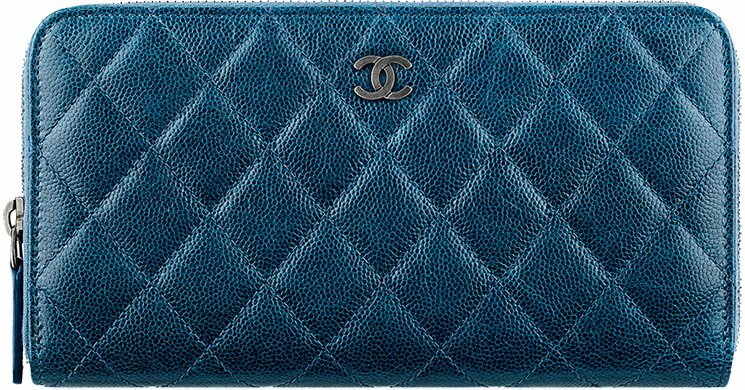 Perfect for keeping your crisp, clean bills and several credit cards thanks to its numerous card slots, this Chanel zip wallet is perfect to take anywhere you go, whether it is at the mall, coffee shop, or at the super market. Style code: A82370, measuring 4.1′ x 7.6′ x 0.8′ inches, priced at $1125 USD, €950 euro, £800 GBP, $1520 SGD, $8000 HKD via Chanel boutiques. The light gold version has the style code: A50097, the price is the same. Imagine walking down the street like any pretty woman and then arriving at the office being on point from head-to-toe such a beautiful way to start your morning right, isn’t it? Well, all of that is possible thanks to the Louis Vuitton Cluny Bag in Monogram Canvas. A new style staple that needs to be in your wardrobe ASAP, the Cluny Bag in Monogram Canvas is ethereal and dreamy like perfect for women who knows the true caliber of fashion. With its structured silhouette that lends it a timeless appeal and the lively and bright fuchsia pink and red colored strap, you’ll absolutely look like you know fashion. Now let’s go on the tiny teeny details about this go-getter. It’s crafted golden color metallic pieces that go well with the Monogram canvas, a front flap with magnetic closure for easy access. And mind you, you can wear and carry this bag in different ways! The top handle is perfect for hand or elbow carry while the removable shoulder strap is a good over-the-shoulder option. Looking inside, it features a zipped inside pocket and a double smartphone inside pocket for organization. The Louis Vuitton Cluny Monogram Canvas in BB size measures 9.8” x 7.5” x 3.9” (L x H x W) and is priced $1870 USD via Louis Vuitton e-store.